The Torres de Quart are a pair of twin towers, which were part of the medieval wall that surrounded the old town of Valencia. 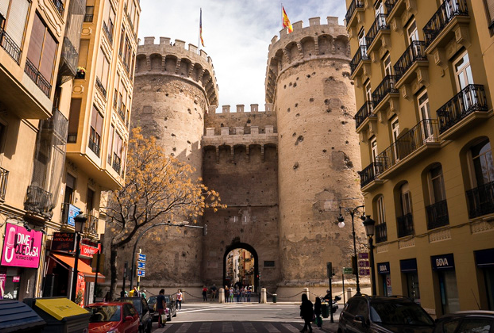 The Torres de Quart, (1441-1460) are a pair of twin towers, which were part of the medieval wall that surrounded the old town of Valencia. They owe their name to the fact that they were located on the road leading from the center of the city, from the Plaza de la Virgen where the Cathedral of Valencia is, to the village of Quart de Poblet. 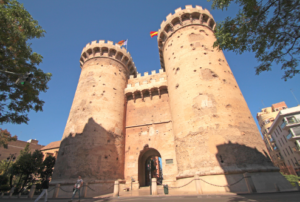 Protecting Valencia for six centuries, Torres de Quart are testimony of the impact of the French artillery which bombarded the city of Valencia during the War of Independence (1808), a total of 132 cannon ball impacts have been counted and more than 1000 marks from rifle bullets. The style of the Torres de Quart is late Gothic and is repeated in several Italian cities, as in Genoa. Be more than just another traveler when you visit Valencia! Let us guide you through the city of Valencia, where the historical past meets the modern and actual present, the perfect place to enjoy and feel the unique Spanish lifestyle. A unique collaborative travel guide created by locals. Website listed on Ideal Escapes. Copyright © 2018. Things to do Valencia. All rights reserved.